Yet even though “Love God and love others” is a good summary of the law, this statement is still a law, and Christians are not called to live according to the law. Instead, we are invited to live within a relationship based on love. While God does want us to love Him and love others, we cannot do this until we know that we are loved unconditionally. 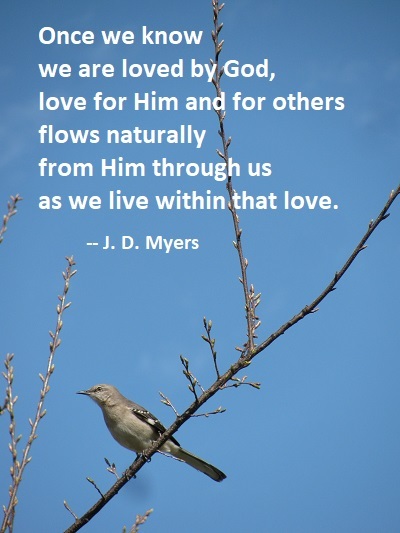 And once we know we are loved by God, love for Him and for others flows naturally from Him through us as we live within that love. This only makes sense, for no relationship can be built on law. True relationships are always and only built on love. 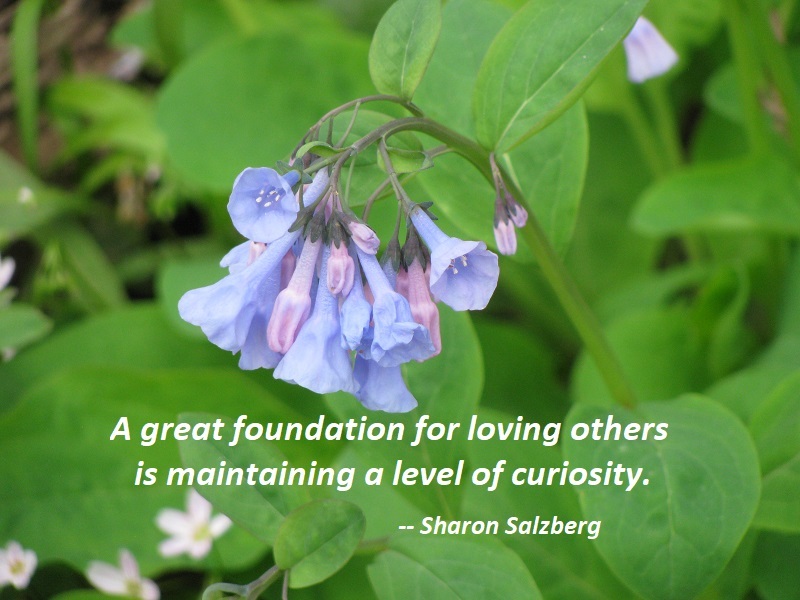 A great foundation for loving others is maintaining a level of curiosity; we can always learn more about those we are close to. Many people think that having someone close to you come out clouds your vision, but in reality it clarifies it. It redefines words for you. It rewrites false stories. It renovates your religion. It forces you to understand sexuality not as some detached issue but as what it is — human beings; in this case, those you know and love dearly. This is the gift relationship gives you. That proximity we get to people will always show us what we couldn’t see any other way. When you are faced with the reality of having an LGBTQ family member or close friend, it forces you to hold up your theology to see what it’s really made of. And when this happens, some of it gets confirmed, some of it gets shifted, and some of it gets blown up. I’d already done my homework. I’d studied. I’d prayed through it. I’d already reconciled so many of my feelings on gender identity and sexual orientation before this moment, so I knew without blinking that I didn’t have to choose between loving God and loving my brother — and he didn’t have to choose between being gay and being adored by God. One of the things you learn when you walk down the path of being an ally is that people aren’t LGBTQ based on the consent you give or don’t give to them, the approval you provide or withhold. That’s not how gender identity and sexual orientation work. 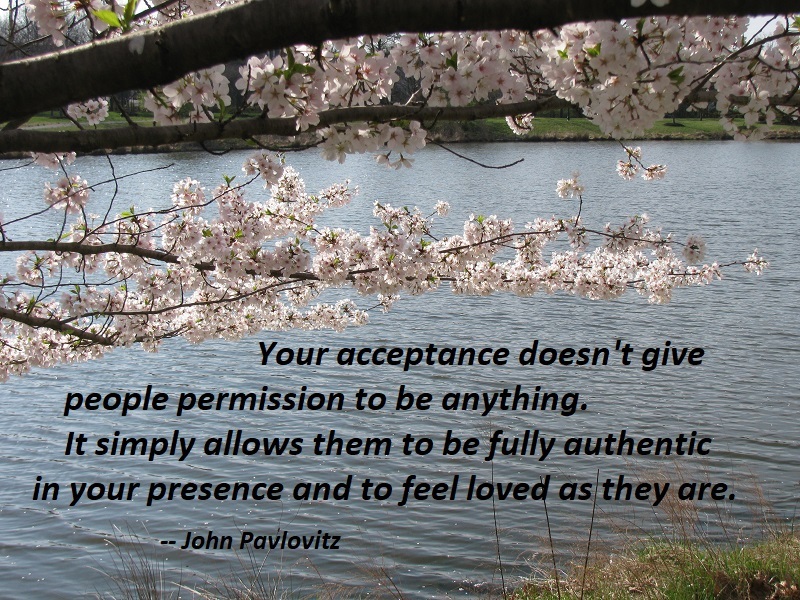 Your acceptance doesn’t give people permission to be anything. It simply allows them to be fully authentic in your presence and to feel loved as they are. It secures people in those places where they should feel fully secured: in their families and friendships and workplaces and churches. If you don’t think you have LGBTQ family members, coworkers, classmates, and friends right now, you may want to ask yourself if that’s because you’ve created an environment in which they would be afraid to share it even if they were. It might be that your words and manner have already told people that they’re not safe to be honest with you. As our society thankfully becomes less and less hostile to the LGBTQ community and as people begin to gradually feel safer in authenticity, more children will come out and more families will have a new reality to reckon with. Those families will continue to seek spiritually and they will continue to need and deserve to be in faith communities where they are fully welcomed. It is one of the reasons the table needs to be made bigger. 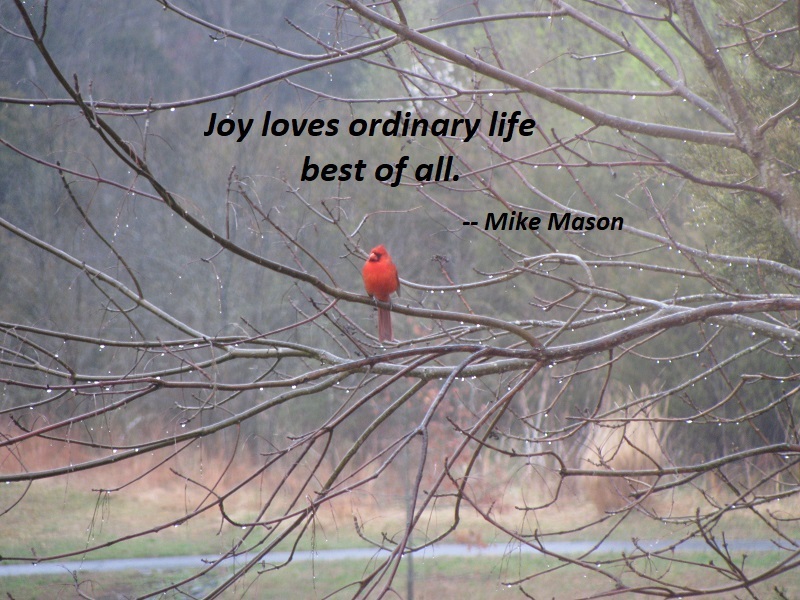 As I examined the reasons for my joy in the midst of the most ordinary days, I realized that joy loves ordinary life best of all. Joy thrives on what all the rest of the world overlooks. The smaller, the plainer, the more lowly the circumstances, the happier joy is. Of course joy can also thrive in exotic and thrilling situations. Joy itself does not inhere, however, in the exotic and the thrilling, which are rare, but in the ordinary, which is everywhere. As I ride on a roller coaster with my daughter, what produces joy is not the roller-coaster but the fact of sharing an experience with my daughter, which I could also do at home. Or maybe it’s watching the people in the car ahead that brings me joy, or noticing the way the sun shines on the rooftops around. Without the enjoyment of such ordinary things, a roller-coaster ride falls flat. Those who think of joy as flashy and exciting will also find it fickle, for not much of life is glitzy. True joy, far from being loud and capricious, is by nature just the opposite — quiet and faithful. Like most utterances of Jesus in the Gospel, “I will not leave you as orphans” is not just supposed to fill us with consolation but to be received as an invitation. It seems to say, As I won’t leave you an orphan, don’t you leave anyone behind. 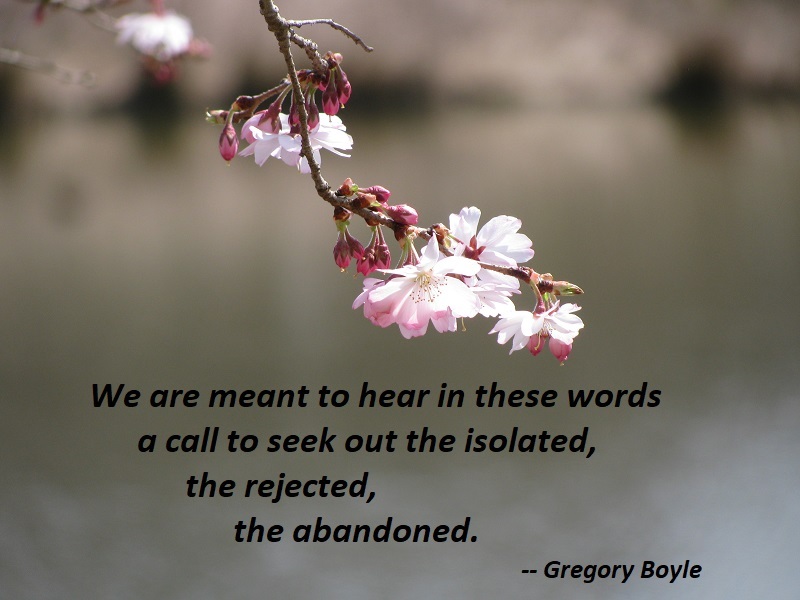 We are meant to hear in these words a call to seek out the isolated, the rejected, the abandoned. Then we are meant to walk toward them, with open arms, and bring them in to the place of belonging. This is the essential task of the Choir. You are currently browsing the Sonderquotes blog archives for April, 2019.